Russia’s drifting polar station Barneo re-opens this year just some 110 kilometers away from the North Pole. Before it closes on April 25 the facility is expected to host talks of the Arctic Council envoys for the first time. Barneo station has been established annually since 2000, at 89 degrees north latitude, becoming the center of research, sports and tourism in the Arctic. 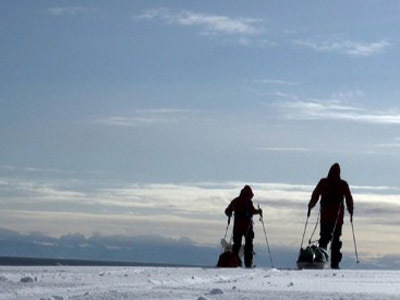 The base, sponsored by the Russian Geographical Society, is operational for only around a month, with the closing of this year’s project scheduled for April 25. The Barneo complex consist of an ice camp and a runway – and has to be built from scratch every year as it’s impossible to keep a landing field on drifting ice for more than one season. The month of April provides the perfect conditions and timing for erecting the base as the polar night ends by then, but the sun is not yet strong enough to start melting the ice. This period of the year is also characterized by the absence of strong winds and moderate temperatures, which rarely fall lower that minus 30 Celsius. The station’s name – Barneo – is nothing, but a joke by the Russian polar explorers as the weather conditions at the base are the complete opposite of the ones at the tropical island of Borneo in South East Asia. The location for this year’s base was found via satellite in the middle of March, with helicopters performing a scouting mission after that. Since March 26, the Russian air force has performed three flights from the northern city of Murmansk to the Barneo 2013 location, delivering around 50 tons of equipment and food, two tractors and 20 expedition members required to establish the base. “The cargo drop is performed by parachute from low altitude,” Evgeny Kirillov, the spokesman for the Russian Northern Fleet, told RIA-Novosti. “The pilot changes the pitching (raises the plane’s nose upwards seconds before the drop) and the cargo rolls out of the bay due to its own weight. “The Russian Air Force pilots are the only ones, who are capable of performing such manoeuvres in super-high Arctic latitudes,” he added. 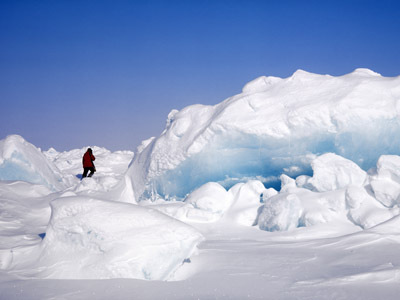 The polar explorers also descended to the ice-floe on parachutes. Building a landing was their primary task as the rest of the supplies – as well as the tourists – are brought to Barneo by Antonov An-74 cargo-passenger aircrafts. The Ice Camp is the heart and the main infrastructure component of the expedition as the staff and guests are housed in specially designed heated tents, in which the temperature is kept between 15 and 18 Celsius. Barneo has been an ultimate attraction for thrill-seekers from all over the globe since 2008. Around 250 tourists visit the station every year in order to perform a ski or a helicopter trip to the North Pole and experience other extreme amusements such as dog sled riding, parachuting, diving in the Arctic Ocean and ballooning. But Arctic adventure comes at a price, with the offers ranging from around €16,000 for a three-day visit, which includes a helicopter trip to the Pole, to over €40,000 for a 21-day ski expedition to the top of the world. The scientific activity will also remain high at Barneo with researchers from Russia’s Hydrometeorology and Environmental Monitoring Agency, State Oceanography Institute and their colleagues from Norway and the US spending April at the base. In 2013, the station will also become a palace for politics for the first time in its 13-year history. The Arctic Council, which unites Canada, Denmark, Finland, Iceland, Norway, Russia, Sweden and the US, was established in 1996 to address the issues of the resource-rich Arctic region and its indigenous people.